Everyone’s favorite time of year is here again—rosé season! With the warming weather comes the burning desire to have a glass of rosé in hand, and who can blame you? The pink drink is everyone’s favorite reminder that spring is here and warmer days are just around the corner, but how is this delicious wine made? As with all grapes that go into a bottle of Brooklyn Winery wine, our rosé fruit—made from Grenache berries—is treated with the utmost care. Once the grapes arrive, they are sorted by hand with the aid of an inclined conveyer belt to ensure that only the ripest and cleanest fruit makes its way into your glass. The fruit is then loaded into our de-stemmer that gently removes the berries from their stems and places them into a holding vessel for 6 to 8 hours of contact with the grape skins to extract the necessary flavor and the salmon hue that we all love. 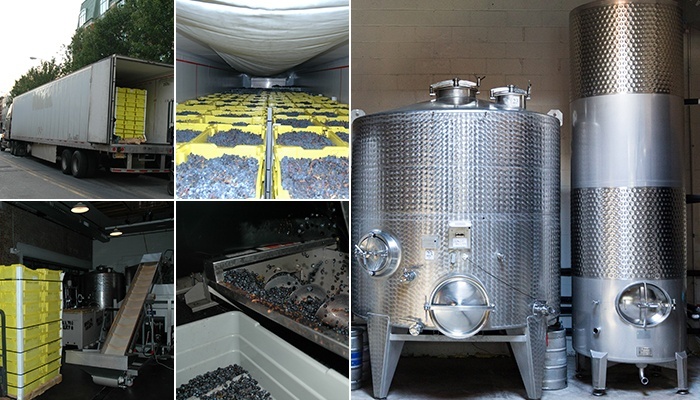 After the soaking period is complete, the grape must (the destemmed grape skins, seeds, and juice) is loaded into our bladder press and the juice is gently pressed out of the mixture and then pumped into stainless steel tanks for cold settling. 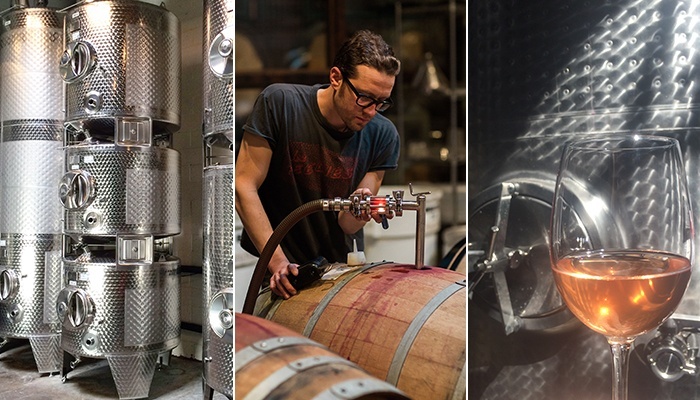 After about 48 hours, the rosé juice is gently racked off any solids that have settled to the bottom of the tank using a mechanical wine pump. Once the racking is complete and the temperature of the juice has risen to 50-60°F, it’s time to inoculate our rosé with yeast, therefore kick starting the fermentation process. For rosé, a slow, steady fermentation is best to preserve the delicate aromatics, color, and overall health of the wine. 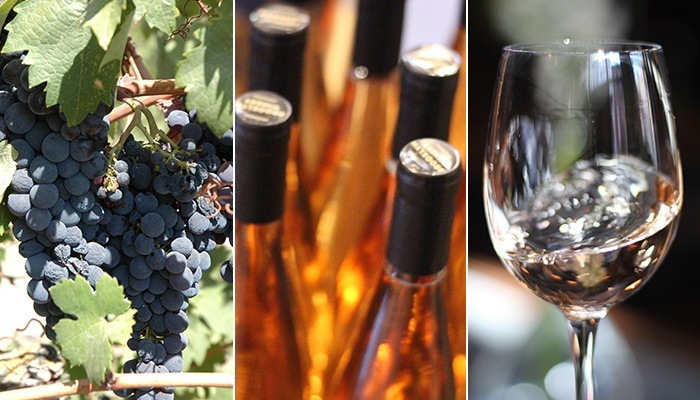 The ideal temperature for our rosé fermentation is at or below 59°F. This temperature stability is achieved through the use of cooling jackets on the stainless steel tanks which are hooked up to a glycol system that allows us to control the temperature. During fermentation the sugar level (or “brix”) of the rosé is checked twice a day to track the rate at which the sugar is being converted into alcohol. Once the brix reading drops into the negative, the wine is considered “dry” and fermentation is complete. This process typically takes 2 weeks. After fermentation, the rosé is again racked to a clean tank and SO2 is added to prevent malolactic fermentation from occurring, preserving the crisp acidity characteristic in any good rosé. At this point in the aging process we are beginning to fine our rosé. 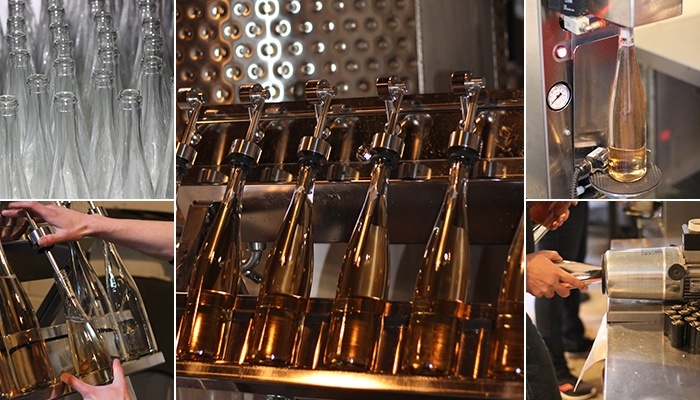 Fining is key to ensuring a clear, clean, beautiful glass of rosé. Step one is adding bentonite, a fining clay used to remove protein haze and other particulate matter from wine. Bentonite has a negative charge that attracts positively-charged solids suspended in the wine and will cause those solids to fall out of the solution, sinking to the bottom of the tank. The process of bentonite fining is used to determine if a wine is “protein stabile” and takes about 3 weeks to settle in tank. Now that our rosé is protein stable we can begin the cold stabilization process. Cold stabilization is used to reduce or remove tartrate crystals from the wine. This is achieved by dropping the temperature of the rosé to near freezing for at least 2-3 weeks and is aided by the addition of cream of tartar. This causes the tartrate crystals to stick to the walls of the tank. The rosé can then be racked to another tank, leaving the tartrate crystals behind. This prevents sediment from appearing in our rosé once it has been bottled and leaves us with a clean and clear finished wine. Filtration is the final step before we are finally able to bottle our beloved rosé and share it with the world, or at least Brooklyn. So sit back, relax, and enjoy your glass of Dry Rosé. Cheers to sunshine, pink wine, and spring time!